My cat is a Balinese - very affectionate, loves attention! He reminds me of a dog, he likes to be walked on a leash and goes to the door when he wants to go out. We just had a litter of kittens - he kisses the kittens and nudges the mother Siamese in the cage to take care of the babies. He is a real joy. Well I adopted my lil man in July as a 2 month old kitten. He looks just like a Balinese but short hair. Very sweet & loving. He shares the house with two 2-year-old cats and 1 12-year-old cat, they all r now in love with him. I also have 4 dogs which love him very much too. 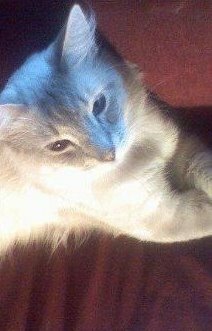 Bailey has powder blue eyes and very beautiful markings ... as soon as I saw this pic of the 'Balinese' I knew exactly what kind of cat I've got. Thanks so much for all your beautiful pics. He's beautiful! they all are! Did he father the kittens? 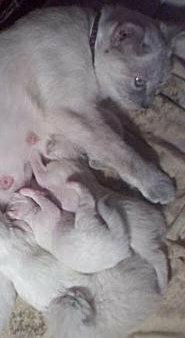 Thank you Theresa for sharing the pictures of your Balinese cat, and your Siamese cat with kittens. They're all gorgeous! I always think Balinese cats are so graceful, with their Siamese looks and long hair.